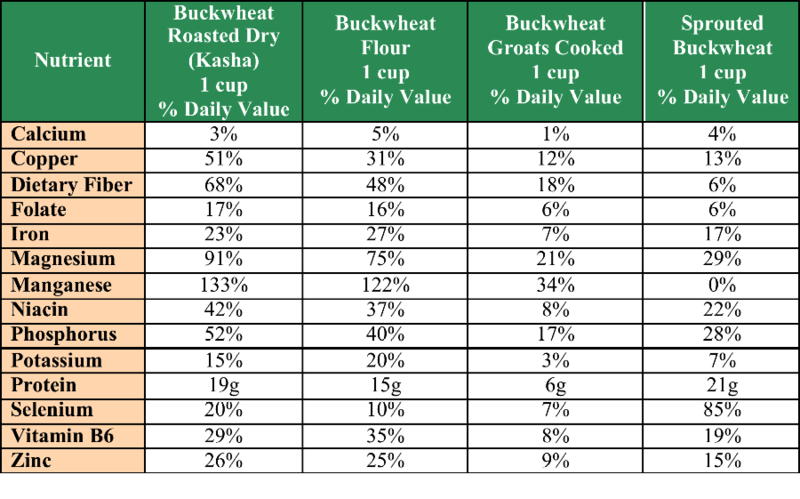 Buckwheat is one of the most commonly overlooked gluten free whole grain “substitutes”. I classify it as a grain “substitute” because, while most people think of buckwheat as a grain, it is actually a fruit seed. Although it’s name suggests it’s a member of the wheat family, buckwheat is not related to wheat and is completely gluten free. Because the buckwheat plant is not susceptible to any major diseases or pests, it’s easy to grow, making it an inexpensive grocery item. Due to its easy to grow nature with blossoms that attract beneficial insects and pollinators, it is often used as a cover crop for weed control in sustainable agriculture. Buckwheat is a nutrient rich superfood. It’s one of the best sources of high quality plant protein because it contains all eight essential amino acids with high concentrations of potassium, magnesium and more. It’s significant amount of B vitamins promotes healthy skin and hair while the high amounts of fiber supports gut health. Another interesting fact is that buckwheat contains the bioflavanoid rutin that is known to prevent blood clots and strengthen capillary walls, helping in the fight against cardiovascular disease. Rutin also acts as a natural anti-inflammatory and may help people with inflammatory conditions such as arthritis and colitis. What most people find surprising is that the protein found in buckwheat has shown to help lower blood glucose levels, thus making it a great food choice for those with diabetes. Need ideas on how to incorporate buckwheat into your meal planning? Add to your breakfast cereal. Lightly toast raw buckwheat groats in the toaster oven and mix into your granola or cereal. This is one of our favorite ways to incorporate buckwheat into our diet. It adds a nice subtle nutty crunch. Buckwheat pancakes are a wonderful way to start the day! Try our recipe. Served as a warm breakfast porridge makes a delicious hearty breakfast. Try Oh She Glows’ Raw Buckwheat Porridge. Cook buckwheat instead of rice; add 2-cups water per 1-cup raw buckwheat groats. Cooked buckwheat has an intense earthy nutty flavor. To calm the intensity, squeeze ½ lemon for every 4 cups of water. To avoid mushy buckwheat, I skimp slightly on the water and, as soon as the water begins to boil, turn off the heat and let the groats steam. Once water has evaporated, the groats are done. If you prefer a more raw experience, try soaking the groats in water for at least 2 hours to overnight. Drain and rinse then serve as your grain at dinner. When eaten raw, buckwheat has a firm texture and mellow flavor. We love topping our buckwheat with tomatoes-based sauces, vegetable chili or split red lentils cooked into a dahl with onion, garlic and red bellpepper. Soba noodles are noodles made from buckwheat. Serve them instead of your standard pasta. If you have a gluten sensitivity, read labels carefully. Some brands of soba noodles add wheat to the pasta. Sprouting buckwheat is easy and a great way to make the nutrients more bioavailable. 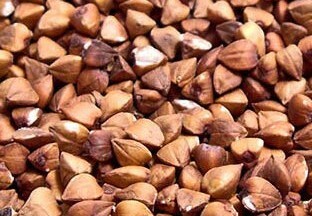 Sprouted buckwheat has a very mild flavor. Sprinkle the sprouts on your salad or incorporate into your wraps or sandwiches. Buckwheat salad makes a great addition to any meal. Try our buckwheat salad with red bell pepper, cilantro and sliced almonds. Our Middle Eastern Vegan Buckwheat Tabbouleh makes a wonderful lunch or light dinner entree. Experiment for yourself and discover what buckwheat recipes you enjoy eating. This entry was posted in Nutrition, Plant-based, plant-based, plant-based, Recipes, Sustainability, Vegan, WFPB, Whole food, Whole food, plant-based and tagged eating for health, healing with carrots, healthy eating, Vegan. Bookmark the permalink. I prepared it with sweet potatoes and sauted onions a couple days ago. So delicious. Great to reheat and enjoy as leftovers. What great ideas! I will try this tomorrow!